This recipe (adapted courtesy of kitchendaily.com) and photo are courtesy of MSD. Heat oil in a large skillet over medium heat. Add onion, bell pepper and garlic and cook, stirring occasionally, until the vegetables are softened, about 3 minutes. Add rice, broth, thyme, salt, pepper and saffron and bring to a boil over medium heat. Cover and cook for 5 minutes. Stir fry chicken, fish and peas until tender then spread across the rice in an even layer. Cover and continue cooking until the rice is tender, about 5 minutes more. Remove from the heat and let rest, covered, until most of the liquid is absorbed, about 5 minutes. Serve with lemon wedges, if desired. 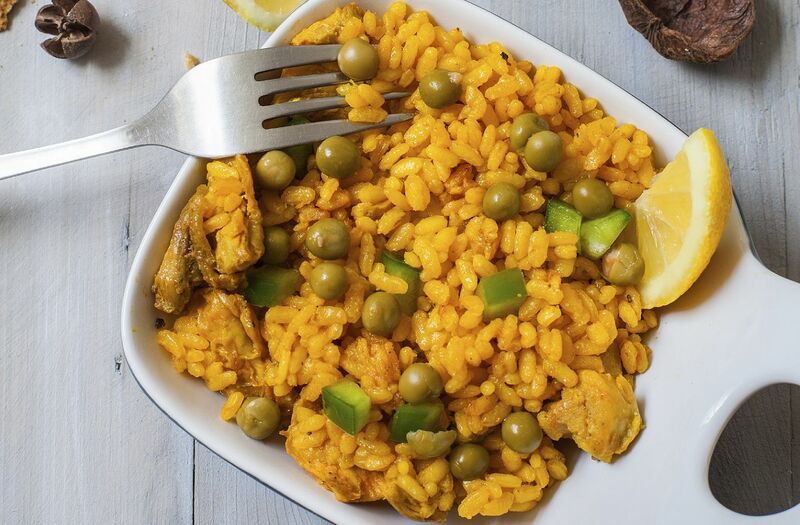 Paella is considered a high-carbohydrate food due to the amount of rice used in this dish. Ensure that brown rice is used to improve your choice of carbohydrates and make sure your portions are controlled. Substitute chicken thighs with chicken breasts for a healthier cut option. Paella is a great way to combine fresh protein sources, low GI carbohydrates (i.e. brown rice) and a variety of vegetables of your choice. Vegetarian paellas are just as delicious!